Sounds great doesn’t it?! How quick, easy and hassle-free! State law and regulation really needs to be dramatically overhauled here. New riders should not have such a quick and easy path to unrestricted riding. It’s putting countless lives in danger. 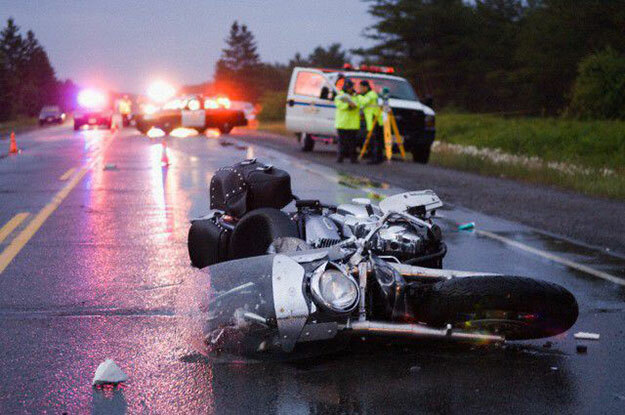 Safety studies show by far the most vulnerable and dangerous time for motorcyclists is their first year of riding, especially in the first month. An institute study conducted in 2008 showed 22 percent of nearly 57,000 collision claims from 2003 to 2007 occurred in the first 30 days after an insurance policy took effect. More than half the insurance claims on supersport bikes occurred in the first three months. If laws are there to protect people, then currently lax and inadequate regulation and requirements surrounding new rider training and licensing should be drastically improved. Isn’t it a good idea to make initial training more intensive and thorough and include mandatory public road riding? Instead of fast-tracking new riders straight to an unrestricted license, how about making the path multiple step, with sensible restrictions on engine size and power, commensurate with age and experience? Could such a system work? Well actually it could – because it already does. Let’s take a quick look at how things are done across the pond in the UK (where this author hails from :-), where the system is designed to guide new riders in a progressive, multi-step way towards a full, unrestricted license. You must pass your full motorcycle test within 2 years, or you have to either take the CBT again or stop riding. Independent riding – you’ll have 10-15 minutes of independent riding. This is designed to assess your ability to ride safely while making your own decisions. are Category B, larger vehicles are Category C and so on. After completing the CBT and passing the motorcycle theory and practical tests, no one can go straight to a full Category A. You will either be licensed as Category A1 or Category A2, depending on your age. Getting to full Category A status is via these two “junior” categories. Riders holding an A1 license can ride light motorbikes with an engine size up to 125cc without “L” plates. They may carry a passenger and ride on freeways. You are then allowed to ride any A2 category motorcycle without “L” plates and carry a passenger. Progressive route: you must have held an A2 Motorcycle License for 2 years, after which you can take another practical test. Passing the test will upgrade you to a full Category A license. Direct Route: if you haven’t held an A2 license for two years but you are aged 24 or over, you can take a Direct Access course (DAS) by completing your CBT and passing the theory and practical tests on a 600cc motorcycle. DAS are intensive courses usually run over 4 or 5 days. So there you have it. The above steps outline the UK motorcycle training, regulation and licensing system to go from brand new rider to getting a full, unrestricted Category A motorcycle license. There is mandatory training (no exceptions!) that includes a good portion of real-world, on-road riding. Engine size, power restrictions and age limits are built in every step of the way. These restrictions and stepping stones are in place for very good reasons. They are designed to protect new riders and make sure they don’t get on machines far in excess of their experience and skill level and cause harm/injury to themselves and other road users. TWO DAYS here in the States to do the same… This is deeply troubling and it really needs changing. Why should licensing requirements be more stringent and training more rigorous and comprehensive? According to the U.S. National Highway Traffic Safety Administration (NHTSA), motorcyclists are 27 times more likely than car occupants to die in a crash per “vehicle mile traveled,” and nearly five times as likely to be injured. No, that number is not a typo. In terms of fatalities, riding a motorcycle is twenty seven times more dangerous than driving a car. Is it unreasonable to ask a State that has the highest level of motorcycle ownership, and also some of the highest motorcycle fatality and injury rates to overhaul it’s lax and hugely inadequate regulations governing new rider training and licensing requirements to protect new riders and do something about bringing these terrible numbers down? This article appeared in re-worded form on RevZilla’s Common Tread section.